As the winner of my 200 follower giveaway, Robert Hingley requested I paint up a Viking warlord. This fellow is a down payment on Robert's first SAGA warband. SAGA allows up to a 50mm base for warlords, and I put it to use here. The figures are by Gripping Beast and the banner is a transfer by the always fabulous Little Big Men Studios. I can hear the warlord shouting "Quote the raven, nevermore, ya buggers!" He may not have said "buggers." My ability to translate old Norse is a bit spotty but you get the idea. Here's hoping this stout fellow serves Robert well on the tabletop! I also went to work fixing my Breton warlord's dappled gray. The dappling was too small so I applied larger mid gray spots as a base to scale up in lighter and larger gray spots. From 3 feet, this looks much better than my first try. I'm tempted to flatten it out with a wash but I've ruined a round of dappling already with a too dark wash. I must remember Dean's advice to "paint for effect." Always good advice! Over the weekend, I stopped by the North Star Tournament. 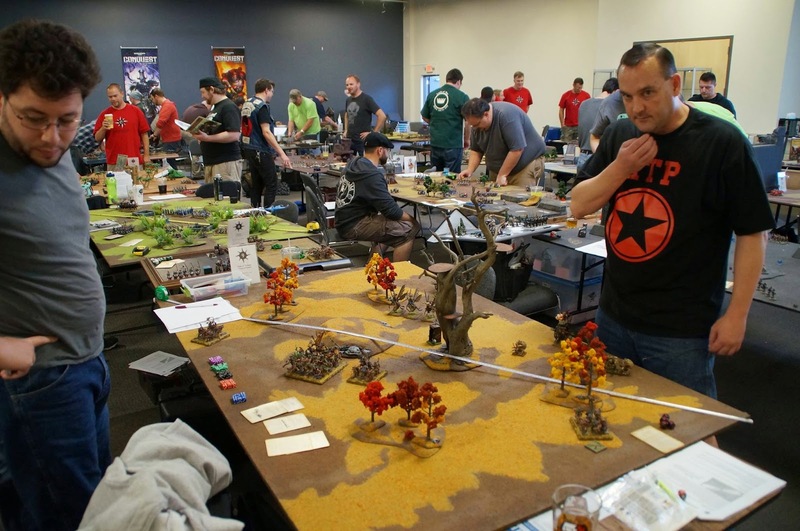 North Star is a superbly run and attended Warhammer event. This link takes you to their Facebook page with pictures of 37 gorgeous themed tables and spectacular fantasy armies. I recognized many of the players from SAGA Storm and everyone I spoke to was having a blast. I'm sorely tempted to paint up a WH fantasy army and join the fun next year. Those of you who've been down this road know Warhammer is not an easy lift when it comes to the rules, buying armies and painting. My gaming plate is full so I'd have to push something off to add this project. Stay tune. If I make the crossover, it will be impossible to miss. Good feedback, Dean. I used to drybrush a lot when I painted Warhammer. Other than metals, I've let this one slip away in my historical painting. Oh, I should've also had mentioned that when doing the spots it's good to have the white watered down a little bit - that way the white spot isn't that strong and the edges are a bit washed out. That is good, thanks Dean! I do wish I lived close enough to come over and paint (and learn) at your elbow. I paint a lot but I do need to slow down and work on the finer points and techniques. I'm hoping to make Adepitcon next spring and sit in on some of the painter classes. Really splendid work! Very impressive. Some stunning work on display here Monty, wonderful work Sir. Thanks Michael and what a finish you had to Zomtober! Love the Breton horse too. Thanks Michael! Still thinking of your work in the woods. The Warlord looks ACE and I can almost hear him shouting insults at some (from his point of view) dastardly enemy warlord. Robert really is a lucky man to be awarded with such a great present. The dabbled horse looks pretty nice too andI've to agree it looks better than with the smaller dabbles. One day I might try my hand on such a horse also. But if I remember correctly for some reasons the Romans didn't use dabbled horses. So maybe it's time for some barbarians. Moiterei, thanks! I'd love to see your work in Ancients. I'd like to take that plunge in 28mm myself some day. That is very kind of you Phil, thanks! Robert is a lucky guy! That is quite a handsome and fearsome looking warlord. The banner is really eye-catching. Thanks Jonathan! I love their banners and shield transfers. Pretty much, I'm hooked on both. I should do a testimonial. Great looking warlord Monty and nice work on the horse! Thanks Christopher, and wow, your cataphracts are something special. Thanks Paul, I hope you're loving your new home! Monty, you have both my thanks and admiration. The Warlord is superb and I will now have to start work on a suitable following. Your figures will be a hard act to follow. Robert! I'm very glad you like him and I'm happy to have jump started a SAGA project for you. It is a fun set of rules that goes well with a beer. Make sure to give us a report some day! Excellent painting. Have you considered 'Kings of War' as an alternative to GW Fantasy? I highly recomend it. This is some of your finest brushwork yet. The blends on that horse are magnificent. Thanks so much, Anne ! I must confess I could take a page out of your book and focus on pushing my techniques via Reaper forums and slowing down. Will I still be saying this next year, and the next? Thanks Stefan, I hope you have a blast at Crisis! Monty, that Viking warlord looks brilliant, I am well envious! On the topic of Norse insults, one of the faves is 'níðingr', connoting cowardice and effeminacy. Shows the priorities of the Vikings quite well, I think! Evan, is there any Viking trivia or history you don't know? Are you a Vikingologist by day and painter/blogger at night? Iif only I could pronounce that word out loud. I might get punched if I did! Monty, that is some mighty fine painting. The warlord looks great! (jealous). This horse is so beauty! Very very good work!